With its classic, simple form, effortless functionality and unparalleled adaptability, the DSW Chair was already a design classic, and now the STIN.com DSW Chair for Kids version brings all that to children's bedrooms and dens. Availabe in a range of vibrant colours that the little ones will love, and with a strong stable base, it is the perfect addition to any family home. Created in 1948, the Charles Eames DSW Dining Chair forms part of a series of moulded plastic chairs designed by the husband and wife team, Charles and Ray Eames. Each chair has the same ergonomically designed seat combined with different bases and arm styles. They are identified by their initials – for example, DSW stands for Dining chair, Side chair with a Wood base. 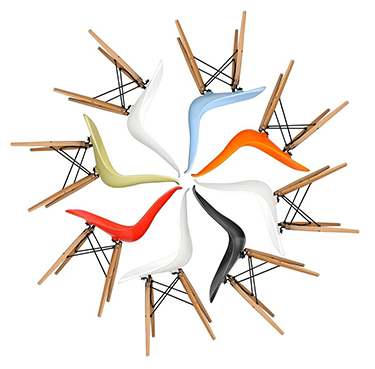 This series of chairs has the iconic status of being the first industrially manufactured plastic chairs. Like its matching armchair, the Charles Eames DAR Chair, the DSW Dining Chair has a deep seat pocket with a curved high back and waterfall seat edge to provide extra comfort. The kids' version is scaled back to two-thirds the original size and is perfect for children's bedrooms, playrooms and studies.